Essential phospholipids: what are they? Phospholipids align themselves in a tail-to-tail formation with their heads facing outward which creates a double layer membrane. 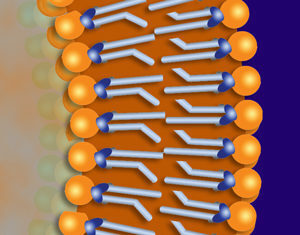 This bilayer structure is used by cells throughout the body for outer membranes as well as for structures inside each cell. Phospholipids are the primary building blocks of cellular membranes. These membranes are the “containers” that hold the living matter within each cell. They also give definition, shape, and protection to many of the substructures (organelles within the cell like the nucleus and mitochondria) within our cells. In addition to functioning as a skin for each cell — keeping the insides in and the outsides out — phospholipid membranes provide protection from chemicals and pathogens that can derail and/or destroy the necessary life functions that take place within each cell. While performing this function, phospholipid membranes are subject to constant attack from free radicals (oxidants), pathogens, and toxins. At the basic level, phospholipids are a phosphate group (phospho) attached to fatty acids (lipids) by means of a glycerol group. 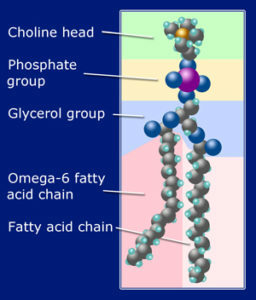 Unlike phosphates, which are attracted to water (hydrophilic), fatty acids are repelled by water (hydrophobic). It is this very love/hate relationship with water that allows phospholipids to form cellular membranes — and liposomes as well. As phospholipids are exposed to water-based solutions, they automatically align themselves in a double-layer (bilayer) configuration – phosphates toward the water and fatty acids away from the water. One of the most important and prominent phospholipids in cell membranes is called phosphatidylcholine (PC) [pronounced FOSS-fah-tide-al-KOH-lean]. At birth up to 90% of cellular membranes are made up of PC. As humans age, the percentage of PC in their cellular membranes can decrease to about 10%. This fact leads many to recommend consistent supplementation with this essential phospholipid. Intact PC — as well as its essential fatty acid and choline components — is required for many vital functions in the cardiovascular, reproductive, immune, and nervous systems. PC and its components are needed for the synthesis of important messenger molecules called prostaglandins which, among other functions, regulate the contraction and relaxation of muscles. Choline is required for the synthesis of intracellular messenger molecules including the neurotransmitters that allow nerve cells to communicate with muscles and each other, and are essential for proper heart and brain function. The liposomes used for Lypo-Spheric™ supplements made from essential phospholipids that include a high percentage of Phosphatidylcholine. These liposomes not only provide optimum protection and superior transport for the Lypo-Spheric™ nutrients, they also help satisfy the body’s need for PC, omega-6 fatty acids, and choline.